For Madison Vorva and Rhiannon Tomtishen, it all began with orangutans. Four years ago-inspired by the work of primate researcher Jane Goodall-the two friends from Ann Arbor, Mich., collaborated on a research report on the endangered primates to help qualify for their Girl Scout Bronze award, one of the highest prizes offered by the 3.2 million-member organization. Vorva and Tomtishen have both been scouts since they were five years old, and they take their roles and responsibilities seriously. So when they discovered that one of the major threats to orangutan populations in Indonesia was deforestation caused by the growth of palm plantations-and that the iconic cookies the Girl Scouts sell can sometimes contain palm oil from plantations on deforested land-the girls refused to simply do nothing. "Being a Girl Scout is about showing stewardship for the land," says Vorva, who is now 16. (Tomtishen is 15.) "We knew we had to keep fighting." For the past few years, Vorva and Tomtishen have worked to get the attention of Girls Scouts of the USA-the scouts' national organization-and get palm oil out of the 198 million boxes of Girl Scout cookies sold each year. 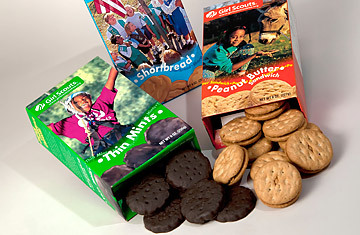 They began by convincing their own troop to stop selling cookies until the Girl Scouts removed palm oil or found a more sustainable source that wouldn't lead to deforestation. As Vorva and Tomtishen spread their message with the help of the Web, social networks and the Rainforest Action Network-an activist group dedicated to fighting deforestation-other Girl Scout troops around the country began rebelling, sending thousands of emails to the Scouts' national leadership. "We were really happy with the way other scouts responded once they found out what was going on," says Tomtishen. Initially, though, Girls Scouts of USA mostly ignored Vorva and Tomtishen's criticisms. After the girls' area council leader contacted the national leadership, the teenagers were granted a conference call to plead their case in 2008-but as Vorva puts it, "they mostly talked at us." The issue flared up again recently after the organization moved to restrict comments on their Facebook page, deleting messages that had called for the group to stop using palm oil as part of a social network day of action. Girl Scouts of the USA has said that the change was made because the Facebook page was being spammed. And they've said that while the Girl Scouts strive to make their cookies as sustainable as possible, their bakers say that there isn't an effective replacement for palm oil-which was added to the cookies several years ago to reduce unhealthy trans-fats in the recipe. Indeed, the Girls Scouts are hardly the only organization or company that has come to depend on Indonesian palm oil. The Southeast Asian country produces more than 20 million metric tons of the stuff annually, more than any other country, and the product is in demand as a food additive and as a biofuel. But the growth of the Indonesian palm industry has had devastating effects on the environment, as producers clear-cut native rainforests and replace them with uniform palm plantations. Orangutans and other endangered species can't adapt to the shift from a varied, diverse habitat to a palm plantation-and if that's not bad enough, palm producers often offer bounties on primates and other species that might get in the way of harvests. Palm oil manufacturing worsens climate change as well-as native forests are cut down or burnt, they release the carbon they sequestered into the atmosphere. The good news is that there is a growing awareness among the major agricultural companies that palm oil simply isn't sustainable. Many are members of the Roundtable on Sustainable Palm Oil, although that corporate partnership does relatively little. The problem is that only 6% of the world's palm oil is grown sustainably-usually by making use of existing forests rather than clear-cutting them-so there simply isn't enough to go around. But that is beginning to change. In part thanks to Vorva and Tomtishen's work, Little Brownie Bakers-a subsidiary of Kellogg's and one of the major Girl Scout cookie bakers-has announced that it is actively supporting palm oil producers who are transitioning to greener methods. "We think it's a start," says Vorva. Girl Scouts of the USA is finally beginning to listen as well. Last week Vorva and Tomtishen had a two-hour meeting at the organization's national headquarters in New York City, and the group agreed to research palm oil to see if they can get more of the ingredient sustainably, or replace it. The entire campaign is a reminder that one of the most effective ways to achieve environmental change is to engage the major companies and organizations that source natural resources from around the world, and pressure them to change. (The nonprofit Girl Scouts' cookie business is worth more than $700 million a year, and much of that money goes to support individual troops.) But every moment of change needs a catalyst, people like Vorva and Tomtishen, who simply won't take no for an answer. The two are still scouts-and the organization should be proud to have them. Watch a video about the growing demand for palm oil for biofuels in Indonesia.